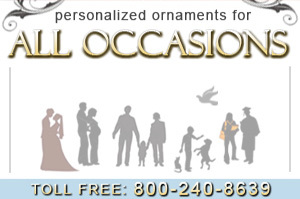 We offer beautiful, heirloom quality brass and nickel plated ornaments with custom engraving and packaging included in the pricing. Each ornament is specially coated to prevent tarnishing so the finish will keep its shiny polish for years to come. The ornaments are also professionally engraved using diamond tipped tools to ensure a high quality and legible message on your ornament.